Your life is like a…guitar. I know, you thought I was going to say a box of chocolates, right? Well, while that is equally as profound and ponder-worthy, I want to invite you to instead consider this analogy. While the chocolate imagery sets forth the variations and surprises of life, the guitar brings to light some very different realities. Much is said nowadays about having balance in the all the different areas of life, work, family, leisure, etc. When one area is out of balance, it affects all the other areas, albeit in ways that are sometimes difficult to grasp. Every musician knows how important this balance is when it comes to tuning. If the instruments in a ensemble are out of tune as they relate to one another, the music making will likely be poor, if not hideous. 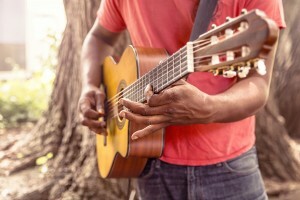 With a guitar, each string must be tuned so they may sound good together. This tuning is imperative. Let’s think about this a little. Depending where on the neck pressure is applied, that is which fret, the pitch varies. The same is true in life. When difficulty comes in any area of your life, the outcome changes. If you are trying to play a chord, the position of your hand affects how far you can reach to impact other notes. This is true in life as well. Once you commit to something in one area, it constrains what you can do in that same moment in other areas. Finding balance in your life only comes as you develop an awareness and familiarity with each area and how they relate. As I was learning to play electric, I would play up and down the neck on the same string, as opposed to finding a comfortable position from which to manage all six strings. Though it worked, it was very limiting and simply sounded amateurish. The whole is greater than the sum of the parts. Though I am learning to love to play lead lines, some of my favorite moments in making music live happen when I play a power chord consisting of three strings, or even better a fully voiced six string chord. The energy in the room changes with that first big chord, everything working together to fill the place with sound. Different parts of life must harmonize. If you correctly play notes that should sound out a beautiful chord, yet are not in tune, forget it. The chord, which in our analogy is your life, will simply sound bad if even one note is out of tune. How often have you felt this in your life? Everything seemed to be in pretty good shape, but there is this nagging feeling sometime is just not right. What tends to happen in those moments is we realize we have been partially muting a string. We are striking it, but one of our fingers is touching it ever so slightly, which is keeping it from sounding clearly. When we listen a little more intently and make the adjustment to hear that note [area] in relation to the others, we are immediately confronted with the fact that we need to tune. I would contend most of us go around muting troublesome, untuned strings most of our lives. It simply does not have to be that way. If we will take the time to tune, which I would contend is a particularly spiritual pursuit, we can greatly improve the quality of our music [lives]. I want to invite you to join me on a journey as we discover how to get and stay in tune. I promise it will be a rewarding and enriching one for us all. And if you like what you hear, sign-up to receive….